A lot can happen in a year, just ask Gleyber Torres. Last June, Gleyber was sitting in a hospital bed about to go under the knife for a UCL tear after sliding headfirst into home. 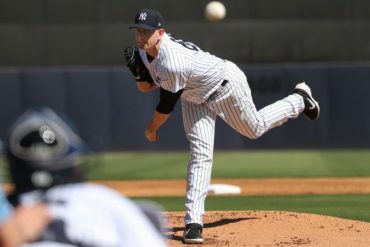 He was hoping to make an impact on the 2017 Yankees, as he was the undisputed top prospect in the organization. 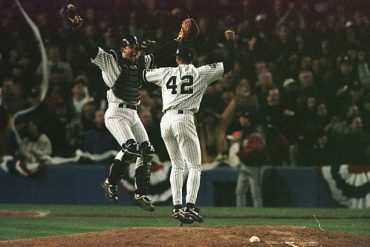 But as the team surged through October and reached Game 7 of the ALCS, all Torres could do was watch from the couch. 10 months after the surgery, however, Gleyber Torres made his MLB debut on April 22nd and never looked back. Since his call-up, he’s 36-for-113 (.319/.376/.593) with 4 2B, 9 HR, and 26 RBI. 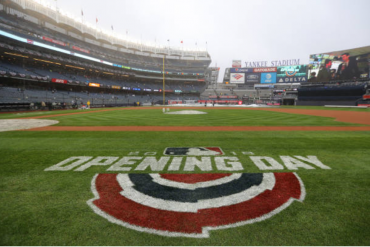 Perhaps most importantly, the Yankees are 24-8 since they gave Gleyber the call. 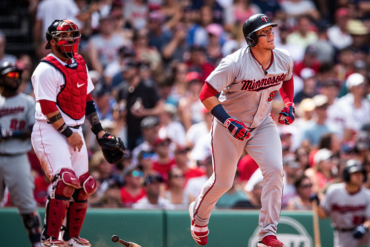 “He’s been an impact player for us right away,” said manager Aaron Boone. 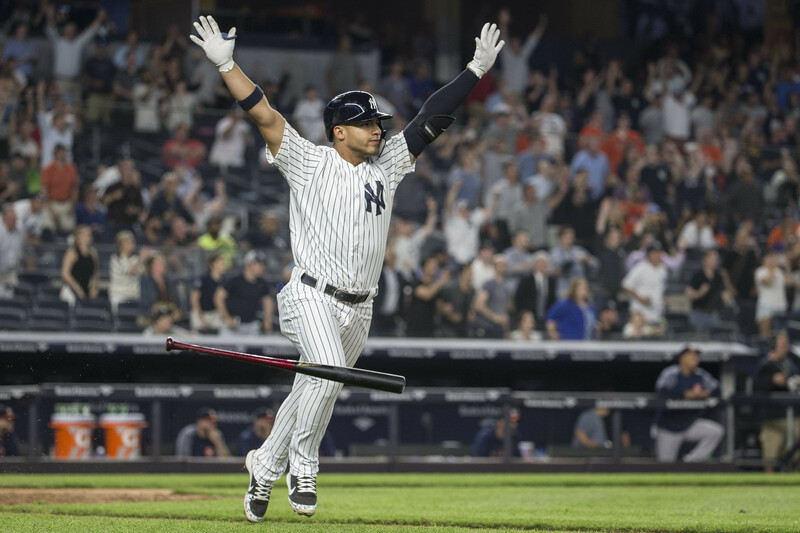 The emergence of Gleyber Torres has resonated around the league, as he was recognized as the AL Player of the Week last week. His two career walk-offs thus far in 33 games makes him the 1st Yankee rookie since Brett Gardner (2008) with multiple walk-offs in a season. Despite being just 21-years-old, Gleyber has quickly become the guy the Yankees want up in the clutch. He’s 9-for-21 (.429) with 5 HR and 16 RBI when the game is tied, and he’s 5-for-13 (.385) with 1 HR and 6 RBI with 2 outs and runners in scoring position. 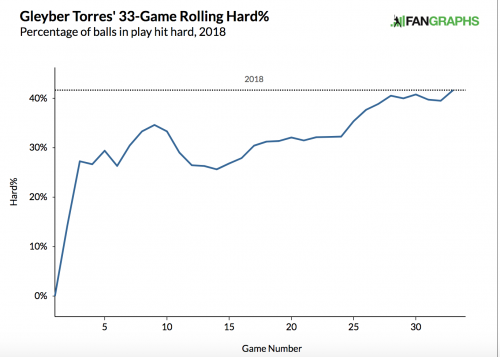 Additionally, if you’re into the advanced metrics like wOBA and wRC+, Torres ranks 12th in the majors in wOBA (.408), ahead names like like Kris Bryant, Francisco Lindor, and Bryce Harper. He also ranks 11th in wRC+ (160), which is exactly what AL MVP Jose Altuve finished with in 2017. On the other hand, weighted run created plus (wRC+), similar to wOBA, accounts for all aspects of a player’s offensive game—except hones in on how many runs a given player is creating for their team. The “plus” helps describe the degree to which the player is above the league median, which is bench marked at 100 for this number. Despite the diminutive sample sizes for these nerdy sabermetrics, the fact of the matter is that Gleyber Torres has now put himself in the Player of the Month conversation, as well as the All Star conversation. Usually when a new player comes up and has a hot start, there is a point where they begin to come back down to earth. We’ve yet to see this with Torres, which begs the question: Has he reached his ceiling yet? In short, my answer is no. Here’s why. 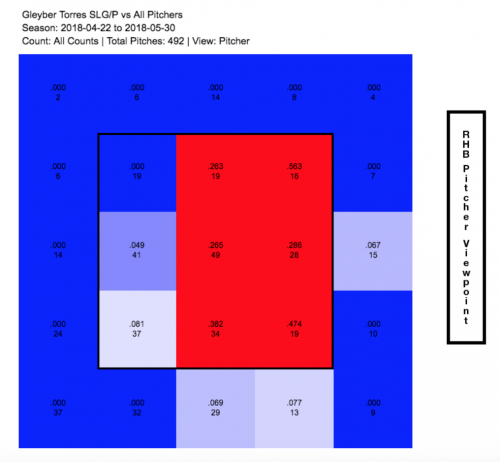 Gleyber is hitting .319 right now, which does not happen if he isn’t using the whole field. In the 33 games he has been up, he has shown that he’s balanced and not afraid to let the ball travel—something seldom seen in a kid his age. Currently, 46.4% of all of his batted are pulled, 28.6% are hit to center, and 25% are hit to right field. So that means 53.6% of all of his batted balls are hit up the middle to right side, which is obviously a great sign. 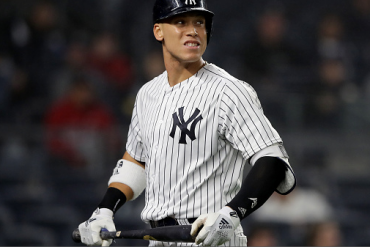 Last week, I wrote about Didi’s tribulations at the plate recently, and how the inability to drive the ball the other way can lead to such a slump. Gleyber will slump eventually as all hitters do, but his balance at the dish will help limit the damage. Another aspect of Gleyber’s approach I’ve found fascinating is that his plate discipline keeps gradually getting better. This is why I believe that he can get even better. Check out his o-swing % in the graph below, which accounts for how many pitches he is chasing out of the strike zone. 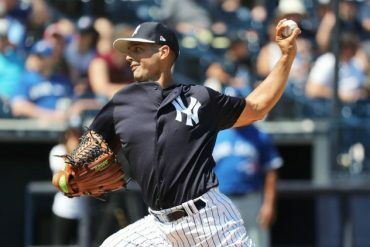 At 39.1% on May 3rd, that number has slowly trended downward, as Gleyber has shaved 5% off since the beginning of the month. 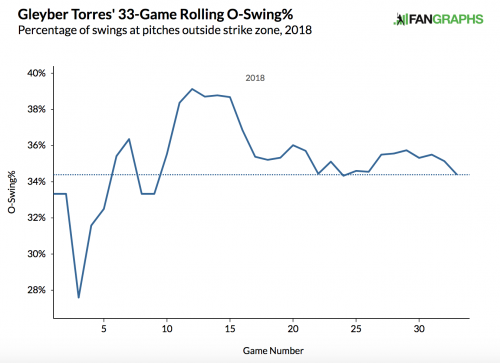 Sure, he does take some at-bats where he will go chase that down-and-away slider that is nowhere close, but by and large, a 34.1% o-swing % is pretty darn good. Further, as his o-swing % has gone down, his hard contact % has been on a steady rise, jumping from 27.1% to 41.7%. As you can see, Gleyber has the ability to hurt you anywhere down the middle and or on the inner half. On that high and tight pitch he has shown the ability to keep his hands inside and pull bombs. And on those pitches middle and inside that are down, he’s shown he can wait back and work up the middle—right side. The league has been put on notice: Gleyber Torres is a problem that is not going to go away anytime soon.